SCVHistory.com LW2897 | Aircraft Down | Stewardess Yvonne Trego, Plane Crash Victim, Rice Canyon 12-27-1936. 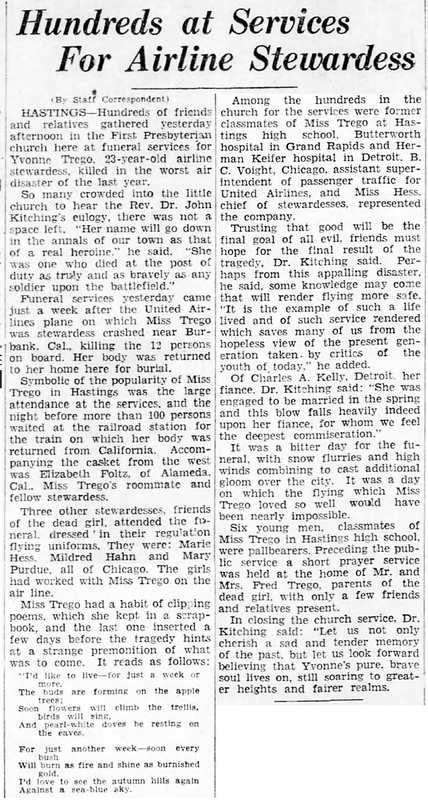 Stewardess Yvonne Trego perished in the crash of United Flight 34 on a mountaintop south of Newhall Dec. 27, 1936. All three crew members and nine passengers were killed. AMONG TWELVE ON CRASHED PLANE. 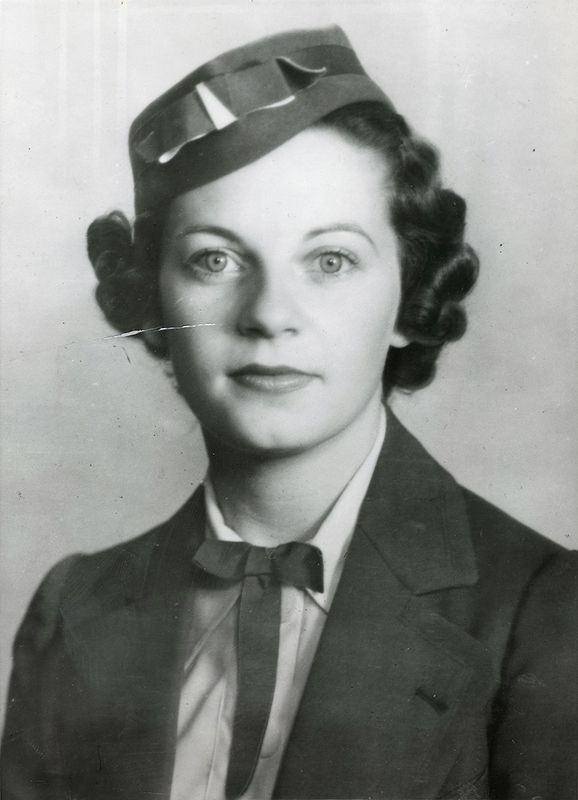 Stewardess Yvonne Trego, a member of the crew of the transport plane that is believed to have crashed in the mountains fifteen miles from Burbank, Calif., with twelve persons aboard. Her home was in Hastings, Mich.
Hastings Girl Is Stewardess On Lost Plane. Battle Creek (Mich.) Enquirer | Monday, December 28, 1936. Hastings — Miss Yvonne Trego, 23, stewardess on the United Airlines plane which is missing in California today, with 13 persons aboard, is a daughter of Mr. and Mrs. Fred Trego of 110 East State road, Hastings. She had lived in Hastings all her life. Miss Trego left Hastings on July 6 to begin her work as hostess on the United Airlines out of Chicago. She was one of eight girls accepted out of a list of 24 applicants. She is a registered nurse, having received her training at Butterworth hospital, Grand Rapids. Her parents received a letter from Miss Trego last Wednesday and at the time she wrote she "just loved" the work. She was engaged to Charles A. Kelly, of Detroit, whom she met while she was a nurse at Herman Kiefer hospital in Detroit. She also has been a nurse at the University hospital, Ann Arbor. Her first run was from Chicago to Cheyenne, Wyo. She later was transferred to the Oakland-Los Angeles run. "Although I have been flying as an air stewardess for only a little over a month, I am very enthusiastic about my duties. I find flying very enjoyable, but even more important, the interesting people I meet keep my job from becoming monotonous. I wouldn't think of trading it for a job on the ground." Miss Trego had been flying approximately 2,000 miles a week in regular duty. Fear Transport Crashed On Way To Burbank, Cal. Yvonne Trego of Hastings, Mich., Stewardess on Missing Airliner. Burbank, Cal. — (UP) — United Airlines announced today that searchers had sighted the wings of an airplane in the mountains north of here, presumably their missing air liner with 12 persons aboard. The wreckage was seen from the air near Saugus, about 15 miles from here. R.E. 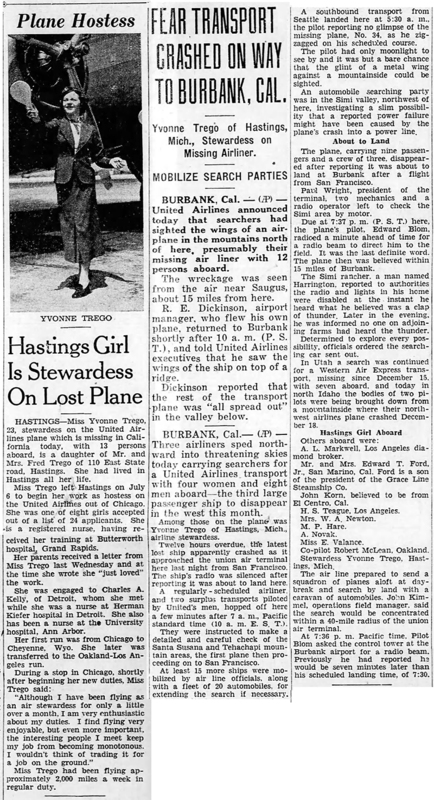 Dickinson, airport manager, who flew his own plane, returned to Burbank shortly after 10 a.m. (P.S.T. ), and told United Airlines executives that he saw the wings of the ship on top of a ridge. Dickinson reported that the rest of the transport plane was "all spread out" in the valley below. Burbank, Cal. — (UP) — Three airliners sped northward into threatening skies today carrying searchers for a United Airlines transport with four women and eight men aboard — the third large passenger ship to disappear in the west this month. Among those on the plane was Yvonne Trego of Hastings, Mich., airline stewardess. Twelve hours overdue, the latest lost ship apparently crashed as it approached the union air terminal here last night from San Francisco. The ship's radio was silenced after reporting it was about to land here. A regularly-scheduled airliner, and two surplus transports piloted by United's men, hopped off here a few minutes after 7 a.m., Pacific standard time (10 a.m. E.S.T.). They were instructed to make a detailed and careful check of the Santa Susana and Tehachapi mountain areas, the first plane then proceeding on to San Francisco. At least 15 more ships were mobilized by air line officials, along with a fleet of 20 automobiles, for extending the search if necessary. A southbound transport from Seattle landed here at 5:30 a.m., the pilot reporting no glimpse of the missing plane, No. 34, as he zig-zagged on his scheduled course. The pilot had only moonlight to see by and it was but a bare chance that the glint of a metal wing against a mountainside could be sighted. An automobile searching party was in the Simi valley, northwest of here, investigating a slim possibility that a reported power failure might have been caused by the plane's crash into a power line. The plane, carrying nine passengers and a crew of three, disappeared after reporting it was about to land at Burbank after a flight from San Francisco. Paul Wright, president of the terminal, two mechanics and a radio operator left to check the Simi area by motor. Due at 7:37 p.m. (P.S.T.) here, the plane's pilot. Edward Blom, radioed a minute ahead of time for a radio beam to direct him to the field. It was the last definite word. The plane then was believed within 15 miles of Burbank. The Simi rancher, a man named Harrington, reported to authorities the radio and lights in his home were disabled at the instant he heard what he believed was a clap of thunder. Later in the evening, he was informed no one on adjoining farms had heard the thunder. Determined to explore every possibility, officials ordered the searching car sent out. In Utah a search was continued for a Western Air Express transport, missing since December 15, with seven aboard, and today in north Idaho the bodies of two pilots were being brought down from a mountainside where their northwest airlines plane crashed December 18. A.L. Markwell, Los Angeles diamond broker. Mr. and Mrs. Edward T. Ford, Jr., San Marino, Cal. Ford is a son of the president of the Grace Line Steamship Co.
John Korn, believed to be from El Centro, Cal. Stewardess Yvonne Trego, Hastings, Mich. The air line prepared to send a squadron of planes aloft at daybreak and search by land with a caravan of automobiles. John Kimmel, operations field manager, said the search would be concentrated within a 40-mile radius of the union air terminal. At 7:36 p.m. Pacific time, Pilot Blom asked the control tower at the Burbank airport for a radio beam. Previously he had reported he would be seven minutes later than his scheduled landing time, of 7:30. Hundreds at Services For Airline Stewardess. Staff Correspondent, Battle Creek (Mich.) Enquirer | Monday, January 4, 1937. Hastings — Hundreds of friends and relatives gathered yesterday afternoon in the First Presbyterian church here at funeral services for Yvonne Trego, 23-year-old airline stewardess, killed in the worst air disaster of the last year. So many crowded into the little church to hear the Rev. Dr. John Kitching's eulogy, there was not a space left. "Her name will go down in the annals of our town as that of a real heroine," he said. "She was one who died at the post of duty as truly and as bravely as any soldier upon the battlefield." Funeral services yesterday came just a week after the United Airlines plane on which Miss Trego was stewardess crashed near Burbank, Cal., killing the 12 persons on board. Her body was returned to her home here for burial. Symbolic of the popularity of Miss Trego in Hastings was the large attendance at the services, and the night before more than 100 persons waited at the railroad station for the train on which her body was returned from California. Accompanying the casket from the west was Elizabeth Foltz, of Alameda, Cal., Miss Trego's roommate and fellow stewardess. Three other stewardesses, friends of the dead girl, attended the funeral, dressed in their regulation flying uniforms. They were: Marie Hess, Mildred Hahn and Mary Purdue, all of Chicago. The girls had worked with Miss Trego on the air line. And pearl-white doves be resting on the eaves. Will burn as fire and shine as burnished gold. Among the hundreds in the church for the services were former classmates of Miss Trego at Hastings high school, Butterworth hospital in Grand Rapids and Herman Keifer hospital in Detroit. B.C. Voight, Chicago, assistant superintendent of passenger traffic for United Airlines, and Miss Hess, chief of stewardesses, represented the company. Trusting that good will be the final goal of all evil, friends must hope for the final result of the tragedy, Dr. Kitching said. Perhaps from this appalling disaster, he said, some knowledge may come that will render flying more safe. "It is the example of such a life lived and of such service rendered which saves many of us from the hopeless view of the present generation taken by critics of the youth of today," he added. Of Charles A. Kelly, Detroit, her fiancé, Dr. Kitching said: "She was engaged to be married in the spring and this blow falls heavily indeed upon her fiance, for whom we feel the deepest commiseration." It was a bitter day for the funeral, with snow flurries and high winds combining to cast additional gloom over the city. It was a day on which the flying which Miss Trego loved so well would have been nearly impossible. Six young men, classmates of Miss Trego in Hastings high school, were pallbearers. Preceding the public service a short prayer service was held at the home of Mr. and Mrs. Fred Trego, parents of the dead girl, with only a few friends and relatives present. LW2897: 9600 dpi jpeg from original photograph purchased 2017 by Leon Worden.